Judges - Are You Ready for a Change? The title describes the type of leaders Israel had from the time of the elders who outlived Joshua until the time of the monarchy. Their principal purpose for having these leaders is best expressed in 2:16: "Then the Lord raised up judges who delivered them from the hands of those who plundered them." The book tells of Israel's history for the period between the death of Joshua and the ministry of Samuel. On the one hand, the book of Judges is an account of frequent apostasy (withdrawing from God), provoking divine chastening. On the other hand, it tells of urgent appeals to God in times of crisis, moving the Lord to raise up leaders (judges) through whom He throws off foreign oppressors and restores the land to peace. Judges reveals an age when "there was no king in Israel; everyone did what was right in his own eyes" (21:25). Deborah is a unique character in the Bible. She is the only woman to be a Judge of Israel. Her story takes place between the years 1209 and 1169 B.C. She was a prophetess and Judge of Israel, the equivalent of king. How she came to be chosen for this position is not recorded but it is evident in her story that her leadership was honored. As Judge, she was also leader of the army of Israel. 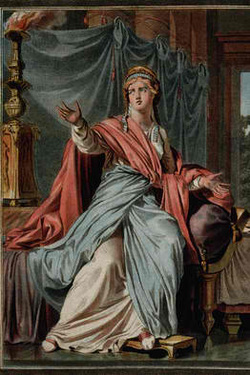 The story of Deborah takes place during the third apostasy. After God delivered the Israelites from Egypt into Israel, they went through seven apostasies. The Israelites intermarried with other tribes in the land and turned away from God into pagan practices. With each apostasy Israel suffers oppression and wars. And with each apostasy, God raises up a deliverer to rescue the Israelites from their oppression. Deborah's story is found in Judges Books Four and Five. The first thing that becomes obvious about the story of Deborah is how much it is like the story of Christ. Over and over again in the Old Testament, we see the Israelites ending up oppressed, often as a consequence of their own actions. And over and over again, we see God send a deliverer to rescue the Israelites. God seems to enjoy sending deliverers that the people would not expect. They certainly couldn't have expected a woman to deliver them from the Canaanites. Jesus was not the Messiah that the Pharisees expected either. Yet, both deliverers accomplished their calling. Barak says he'll obey this command only if Deborah accompanies him. She agrees. This general is given a prophecy that his army will win but won't go to battle without Deborah. We can discern two things from this: that Barak had incredible faith in Deborah, if not in God, and that Deborah was a courageous and faithful woman. Deborah teaches us that with God all things are possible. No person is useless or not good enough to serve God. And, when we are willing to surrender our will to His, God can work through us to achieve incredible victories, even against terrible odds. In chapters 1:1-3:6, we find that the Israelites have failed to keep their part of the covenant (among many other things), and did not entirely conquer and take control of all the land that they were promised. This problem unfortunately grows wildly out of control as time goes on. From 3:7-16, God raises up judges to rescue Israel several times. A cycle of in-rescue-worship-sin continues constantly. These rescues were temporary because we find that the nation’s obedience only lasted as long as the life of that particular judge. Out of the 14 judges mentioned, the major judges that stand out are famous stories of Deborah, Gideon, and Samson. In chapters 17-31, we see Israel slumping into a horrid state of moral demise and ruin. Predominantly in the tribes of Dan and Benjamin, we see how far man has really turned from the God of Abraham. The Dan tribe had almost completely given in to the worship of idols made by a man named Micah, even to the point that they practically defend it. Later, the entire tribe of Benjamin is wiped out down to 600 men in a violent and vicious civil war. It is here we read, “In those days Israel had no king; everyone did as he saw fit” (Judges 21:25). fall away and reject Him, still He remained faithful to His promise and went to the cross to die for us.